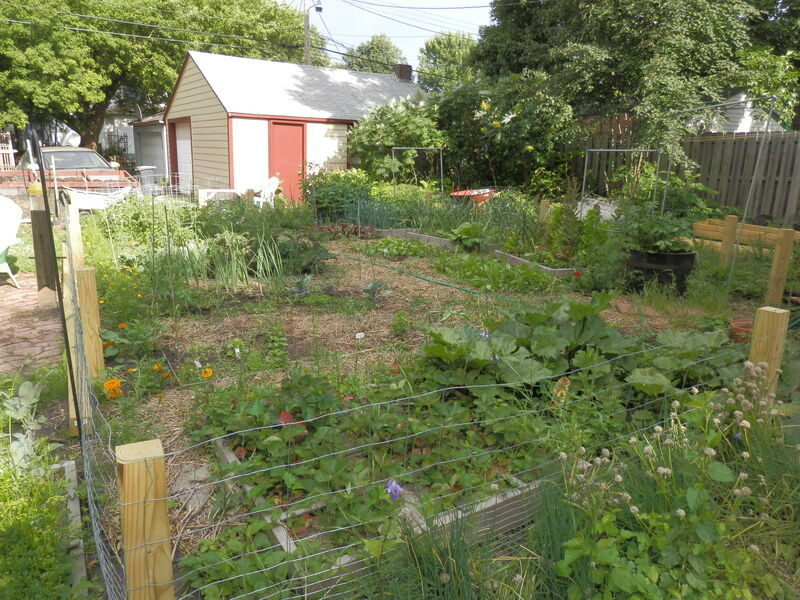 Back in January, I signed up for the Permaculture Research Institute’s Urban Farming program. I’ve been attending classes, meeting people, getting excited about all I could do and — new for me — putting limits on what I am going to do. 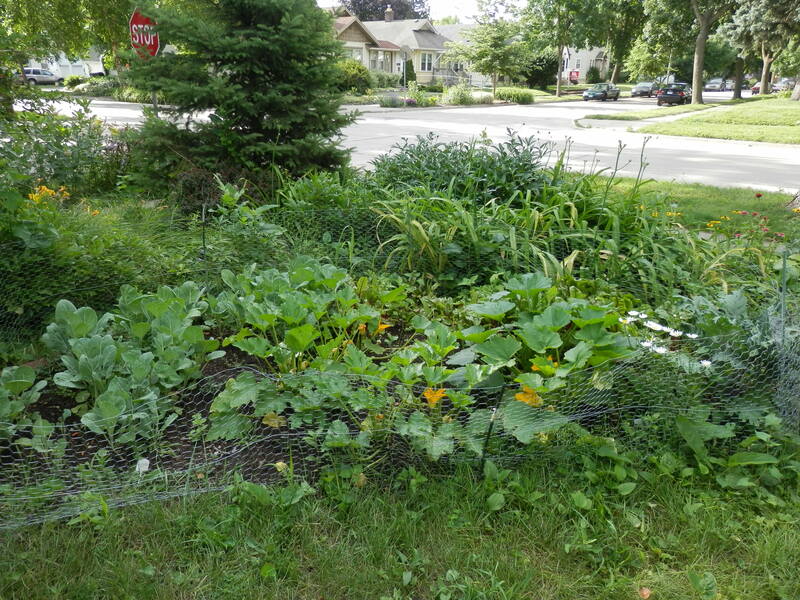 This year I’m saying “yes” to enlarging the vegetable garden, adding more fruits and berries, making the public space (boulevards) more attractive, and building a better looking and more functional infrastructure (fences, gates, paths, boxes, trellises, teepees, cold frames, a hoop house for fall). All this work should take us through the end of the year. If conditions are good for it (meaning, I’ve let plants go too long), I’m going to try seed saving. I took an intro to seed saving class last Saturday and am now convinced of the critical importance of learning this skill. This year I’m saying “no” to urban chickens and mushroom logs. I need to focus on doing veggies and fruit better before I move on to other things. For the foreseeable future, I’m saying no to fish farming, aquaponics and bees. I’m out in the yard several days a week. In addition to the unexpected tan, one of the pleasant side effects of all this hard work has been meeting neighbors. People like to talk about gardens, and as they do, they often ask about the solar panels and other things we’re doing here. I’ve had many chances to talk about the transition away from fossil fuels. Of course, I also love all the compliments we get on our garden. It’s encouraging to know that people appreciate what we’re trying to do. Because of our focus on the home tour and the need to build fences, we got a late start with planting. Our indoor seedlings were a bust so we had to buy plants or reseed outdoors. Here’s how our garden is shaping up. 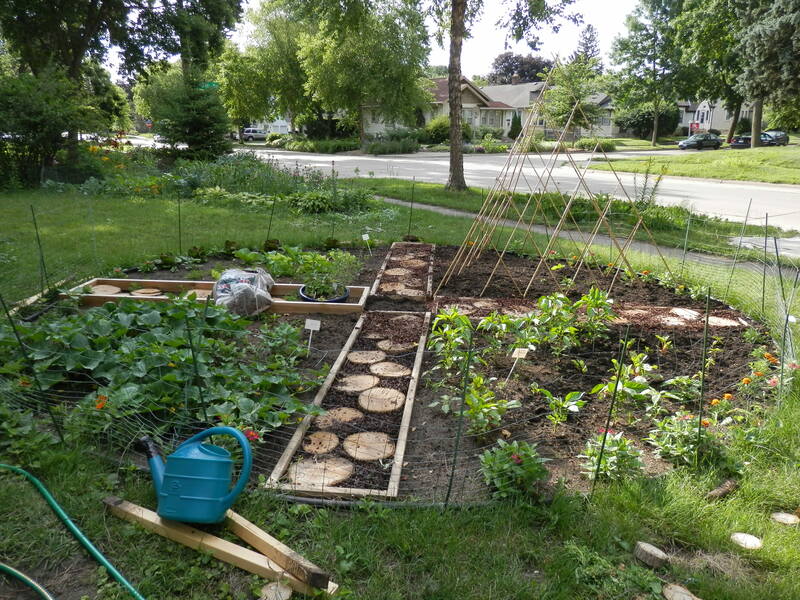 This is the primary backyard garden. I have 2 dozen tomato plants, as well as onions, chives, leeks, kale, beets, lettuces, radish, carrot, peppers, bok choi, potatoes, fennel, nasturiums, marigolds, rosemary, oregano, dill, basil, garlic, rhubarb, strawberries, brocolli, brussels sprouts and cabbage. The new round garden has a border of zinnias. One section holds cucumbers and kale. Another section holds peppers and swiss chard. One section has peppers and lettuces. One section has soil problems. I’ve added the teepee and am going to put beans there to improve the soil. I’ve purchased a bean innoculant for nitrogen fixing. The pathway is made of sections of the tree that was cut down from this spot in order to install the solar panels. We’ve used the cocoa bean husks around and under the wood sections to help hold them in place. We pulled all the flowers and weeds from here and planted squash, zucchini, peppers, blueberries and grape vines. We’ve got zucchinis all ready to pick! 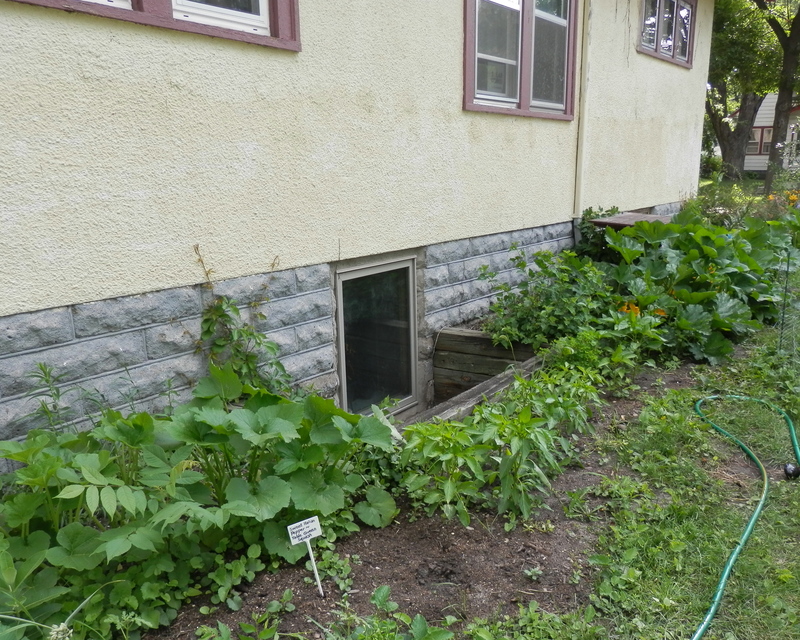 We’ve converted part of the front flower bed to collards, chard and zucchini. There has been some pest damage and they may not be getting as much sun as they’d like, but everything is growing. So far, so good. 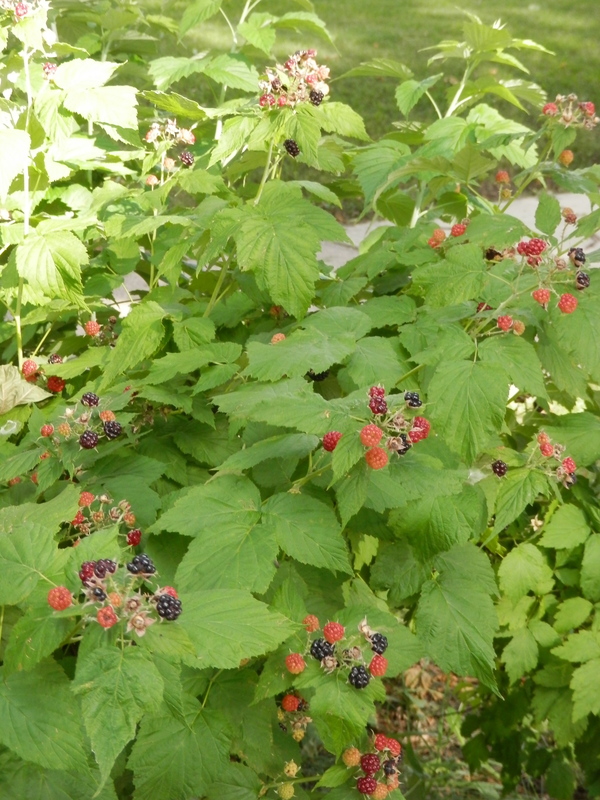 This is a black raspberry bush that planted itself. I love the multicolored berries. We had to move our regular raspberry bushes last year to paint the garage. Two of them died, but the others are hanging in there and producing lots of fruit despite their small size. We’ve got a few blueberries on the brand new blueberry bushes and for the first time, we’re seeing a few berries on the currant bushes. 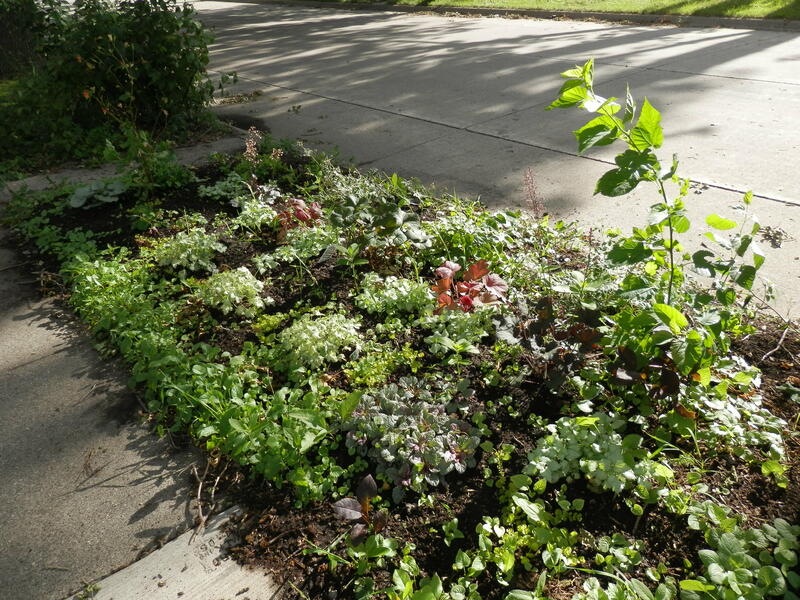 All the plants that were removed from the side of the house were moved into a flower garden by the sidewalk. 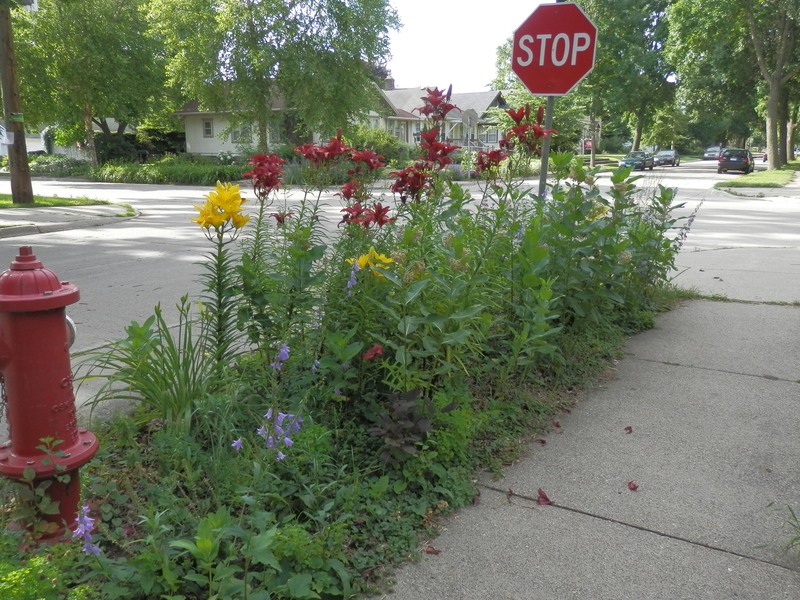 With extra shade from the boulevard trees, they are thriving. This has long been a problem area – the front boulevard that is heavily shaded for most of the day. We’re starting over with a variety of silvers, reds and yellow-greens. It’s been 3 weeks and everything is still going strong. We’ve been working on this area for quite a few years. The soil was very bad, but bulbs do well here, as does the oh-so-fragrant milkweed. I added more penstemon and a couple of lavender plants, yarrow and some small silver plants. 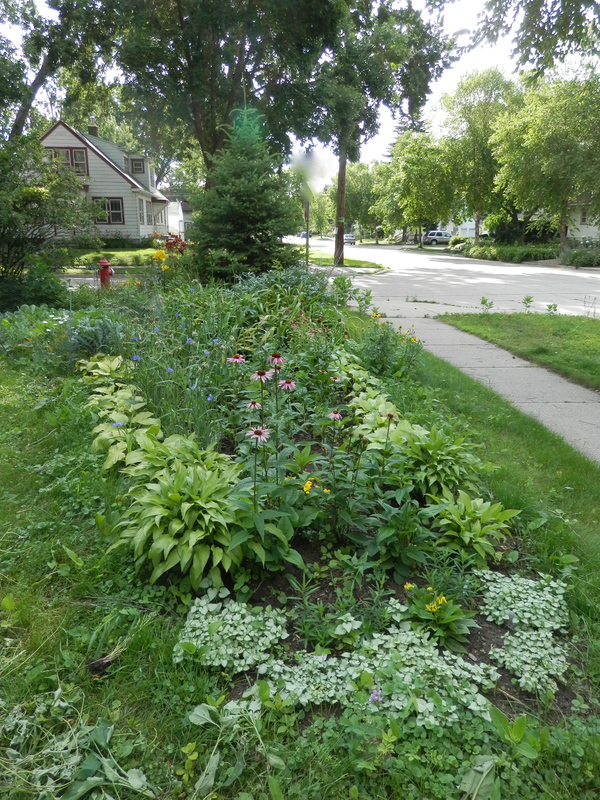 I don’t have photos of the work in the rain garden, which is ongoing. We added an elderberry bush, 5 ground cherries and two more horseradish plants. We’ve built three raised beds but they aren’t filled yet. There’s lots to do in this area.